Thursday | November 16, 2017	This Yuletide season, convene at Bakerzin for a delectable medley of ‘must-haves’. From traditional yule logs to the contemporary French cake, Croquembouche and the Classic Aged Fruit Cake, all of which must not be missed! As you soaked in the festive revelry, add a little festive sparkle with a Nordic festive pastry, The King’s Bread. Culminating all the best ingredients of the season with premium nuts and spices, making this your feasting indulgence! 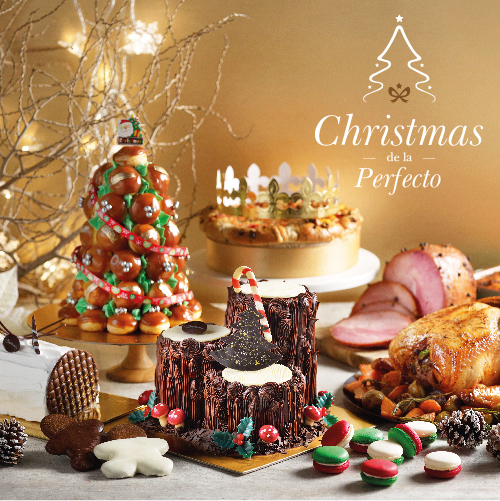 Bring home Bakerzin Christmas de la Perfecto takeaway spread and have yourself a Merry Jolly Christmas! Get 15% Members Discount on Christmas de la Perfecto takeaway menu from now till 15 December 2017! Download the above coupon now and claim in-store! For online purchases, apply code PERFECTO on cart to enjoy the discount!